Essay writing is both an art and a science. Even the most profound or insightful thoughts or opinions, expressed with great creativity (the art of essay writing), will fall flat if those essays lack solid structure (the science of essay writing). From start to finish, you should follow a very specific process, if you are going to produce an essay that is well organized, fluently written, and coherent. You may be given a topic by your instructor, or you may have the freedom to select a topic within a broad area. Topic selection is important if you have length parameters. For example, you cannot possibly write an essay on the financial crisis of 2008 if your essay length is 500 words. You will have to narrow it to something quite specific, perhaps the risky practice of mortgage lenders as a factor in that crisis. Every essay must have a purpose. Are you going to inform, explain, define, compare/contrast, argue an issue or tell a story? When you combine your topic and purpose, you will then get an idea for your thesis statement, which, of course, every essay must have in its introduction. Going back to the topic of risky mortgage lending, your purpose may be to explain or to argue that risky mortgage lending practices were a leading cause of bank failures and that regulations should be put into place that prevents such practices in the future. Now you have a thesis – the major point you will be making. This step in the process will require you to get all of your thoughts down on paper and to conduct any research to gather facts and data to provide your explanation or opinion. There does not need to be any specific order in which these thoughts or data are recorded – just get the stuff down on paper where you can see it all. Now you are ready to get your “house in order.” There may be some thoughts and/or research information that should be combined because they are closely related. Some thoughts and/or information may be irrelevant and thus are discarded. It is also a good idea to prioritize your sub-topics, placing the most important one first and the rest in descending order of importance. Each sub-topic should be a paragraph in the body of your essay. You don’t have to produce a formal outline with Roman Numerals and letters, unless your instructor requires you to submit one along with the finished essay. Some instructors may want different organizers, such as a Venn diagram for a comparison/contrast essay or a timeline for a narrative. If you must produce an outline, remember that your Roman numerals will probably be only three: I = Introduction; II = Body; III = Conclusion. Under the body, you will have capital letters for each paragraph. And under those letters you will have Arabic numbers for each of the details that will support the topic sentence of that paragraph. Remember, to structure essay writing so that it will be organized and coherent, you must have some type of organizer, whether it is a formal outline or some other methodology! You are now ready to use your outline or another organizer as the skeleton to which you will add the bones and muscles (paragraphs with good topic sentences and supporting detail). Begin with your body paragraphs first, because, as you write, you can be thinking about what your introduction must say. Leave that introduction for last – believe me, it will be better if you do! As you write your body paragraphs, focus on content but, as well, on being grammatically correct. Vary sentence types and lengths to make your writing more interesting; and make your last sentence transition into your next paragraph. To catch the immediate interest of your reader, begin your introduction with a short, shocking sentence or an anecdote that will lead into your thesis statement. The purpose here is to introduce the topic and to provide the reader with your “take” on the topic, or your purpose for writing on this topic. If you don’t have a point to make, why are you writing this essay at all? I always suggest two revisions of a rough draft. The first one, you should do yourself. Read your essay out loud to yourself – you will be amazed at how many errors you will catch when both your eyes and ears are involved in the process. You will find sentence fragments and run-ons; you will find sentences that should be shortened or added to the one before or after. You will discover spots that don’t flow well enough. Proofreading refers more to mechanical issues – spelling, punctuation, etc. If you have used a good program that has spelling and grammar checks, many of these will be fixed for you. But do not rely on the apps to fix everything – they are certainly fallible. The second editing and proofreading should be done by someone else, if at all possible. This other person is more objective and may point out awkward sentence structure or incorrect vocabulary usage that you didn’t detect. Once you have typed the final draft, you are truly finished! 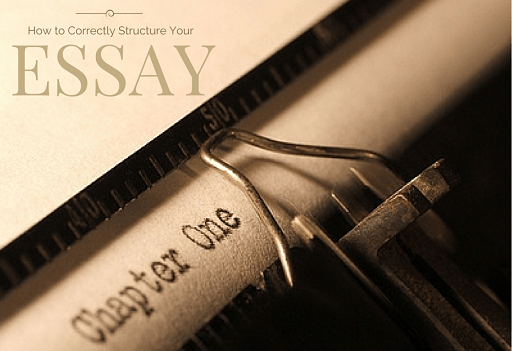 If you have followed these steps for structuring your essay, you will have a piece you are proud to submit for a grade!